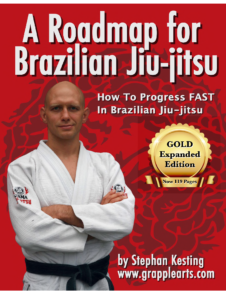 I am a HUGE proponent of using any and all resources, tools, books, instructionals from outside sources to develop and make progress in your own jiu-jitsu journey (or life.) My life would never have progressed the way it did without the mountains of books that I purchased and consumed, the seminars I attended, the education I acquired, and the people that have given me advice or counseling along the way. I firmly believe that if you want to be the very best person and move much closer to your own human potential in life, you MUST use outside resources from a variety of perspectives. I have noticed, witnessed first hand, and observed situations in jiu-jitsu that tells me that jiu-jitsu still has a long way to go as far as getting up to speed on modern learning and getting past some “cultural” situations. Many schools and instructors are still in an old-school mindset that you can’t/shouldn’t train at other academies, you can’t use outside resources, you can’t listen to other instructors. THIS IS COMPLETE NONSENSE and if you are experiencing this, you must take note and consider the ramifications of this brainwashing and attempt to indoctrinate you into flawed human learning methodology. Learning comes from a variety of situations. Some people like to learn visually, or by hearing, or doing, and they also learn differently depending on the style of instruction. That’s why in science they have “lectures” and also “laboratory” sessions. That’s also in music education where they have “Practice” and “Theory” learning protocols. The one main thing to consider is that it takes teammates to practice and improve in jiu-jitsu. You can’t do jiu-jitsu all alone every day. You can read books, watch videos and study jiu-jitsu by yourself to make faster progress, but you need training time with partners who come in a variety of shapes and sizes, skill levels, and styles. (That also could be another reason to train at other open mats or gyms to get exposure to more variety in your training.) But being committed to your training partners is important and shouldn’t be ignored. They count on you to show up to class and you count on them to show up to class. So don’t mistake this as an excuse to be a bad teammate. That’s not what I am saying. I’m saying that if someone is so insecure that they are calling you names or demanding loyalty (that they don’t even come close to earning) then you have yourself a sub-optimal situation and you must make some decisions on who you want to associate yourself with in life. If you have a very limited budget and can only get one video-based online instructional resource, I would hands-down get a lifetime subscription to The Grapplers Guide The Grapplers Guide is an online website that features well over 6,000 video tutorials on jiu-jitsu theory and techniques. The website is owned and operated by Jason Scully (you can read his fascinating story in the book Master Jiu-Jitsu Master Life) but incorporates videos and tutorials from some of the highest level practitioners in the art of jiu-jitsu. The site is always being upgraded and updated and the onetime membership is FOR LIFE. You pay once and you have access forever and ever (AMEN!). The typical membership is usually around $300.00 but the website does offer discounts if you make a one-time payment (often under $200.00). It is by far, hands-down, the best value for your money if you can only afford one single resource based on your financial constraints. Having a membership to the website also allows you the opportunity to become a member of a private Facebook Group that is very active and valuable. You won’t even believe the amount of content available from this single resource. I’m a busy guy with a professional career. I own and run a wealth management and financial planning firm. As we all know, regardless of job or profession, time gets tight! We all have other obligations and responsibilities in life. Sometimes that may be watching kids sports, or eating lunch, sitting in on boring conference calls, or attending mandatory meetings where we get stuck in the back of a room trapped with nowhere to go. I try and maximize my time and use my time as effectively and efficiently as possible. One resource that I have on me just about at ALL-TIMES is my iPhone. 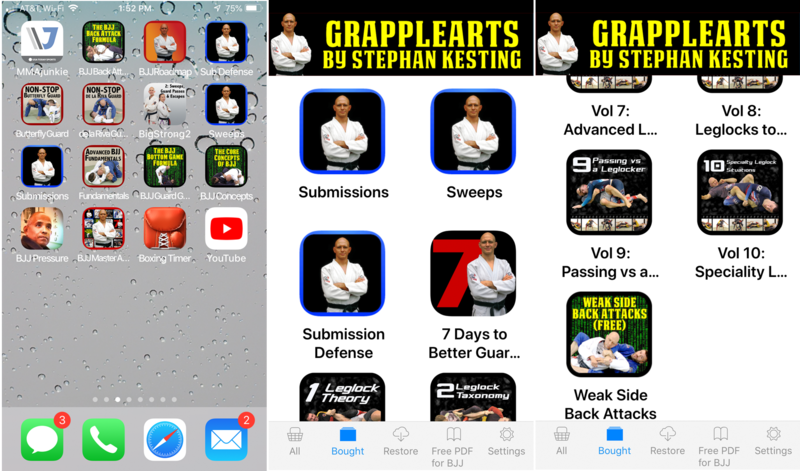 I have a number of BJJ Apps that are locked, loaded and ready to go for review purposes. I could be sitting on a train, an airplane, eating lunch alone, attending a wedding/funeral, or stuck in some other bad situation. No worries, I can fire up an App and use my time wisely on the more important things in life like jiu-jitsu. Here are just a few screenshots from my iPhone if you don’t believe me. Give me my iPhone and a pair of headphones and I could make good use out most bad situations that were unavoidable in modern life as a professional.